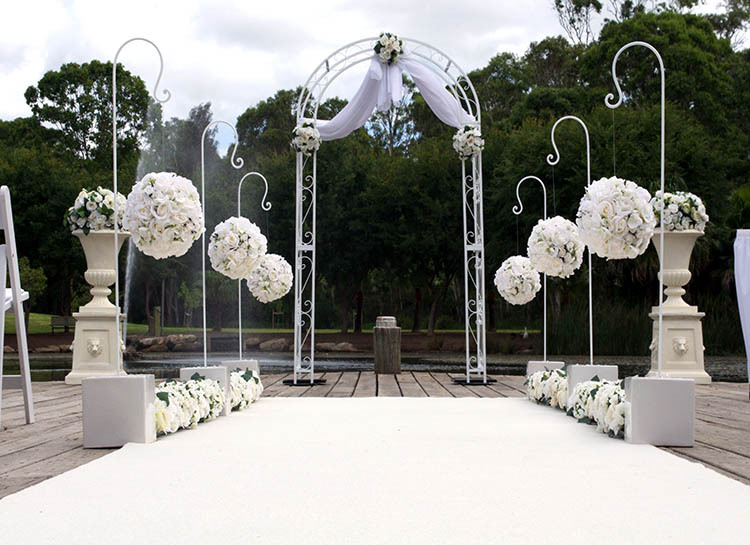 Adorable Wedding Concepts wedding decoration hire services are available right across the Sydney metro area. 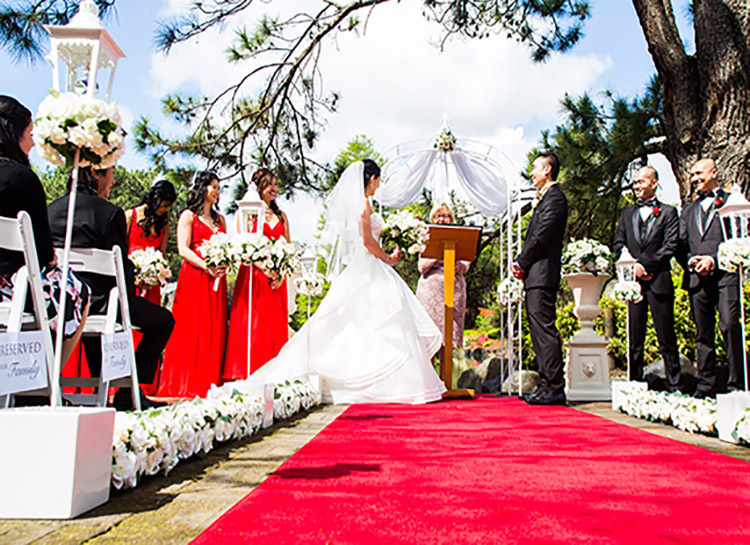 With over 15 years of experience designing and styling outdoor ceremonies we’ve established a reputation for delivering high quality products with excellent service and an affordable price. Wedding styling and wedding setup is our specialty but if you’re looking to create a look all of your own we can provide wedding decoration hire items on request. We’ve recently added new wedding decoration hire items to our extensive range including some beautiful ceremony pedestals & urns shown below. These stunning floral arrangement in the urns & pedestals can changed to suit your wedding theme and live floral settings can be added . 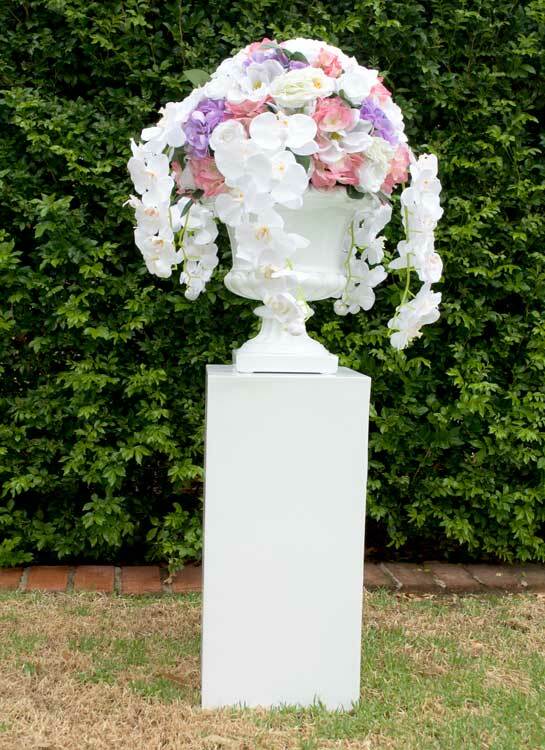 Pedestal & urn are a brilliant accompaniment for any wedding ceremony setup outdoors. Add them to one of our existing settings, Princess Wedding Ceremony Package, or replace our rustic pedestal & urns available in our Elegance or Eternity Wedding Ceremony Package with this modern a clean look. 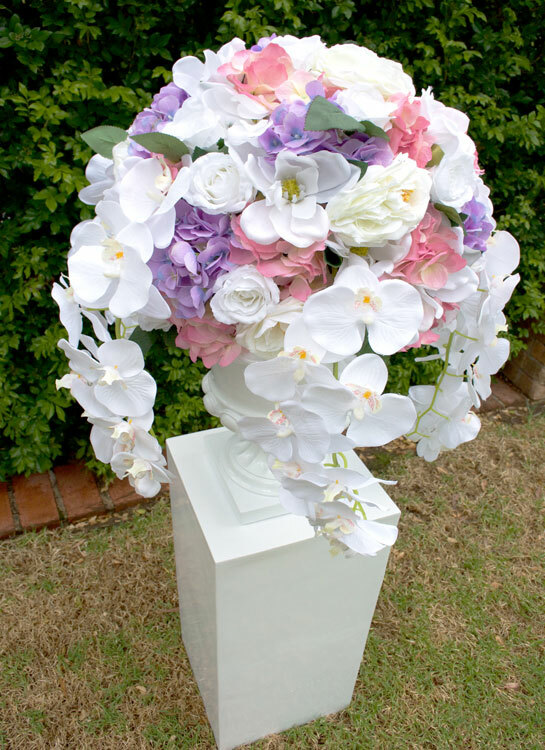 Adorable Wedding Concepts has free standing urns as featured below. They are one complete item. Multiple floral arrangements can be created to fit this high standing and beautiful urn. 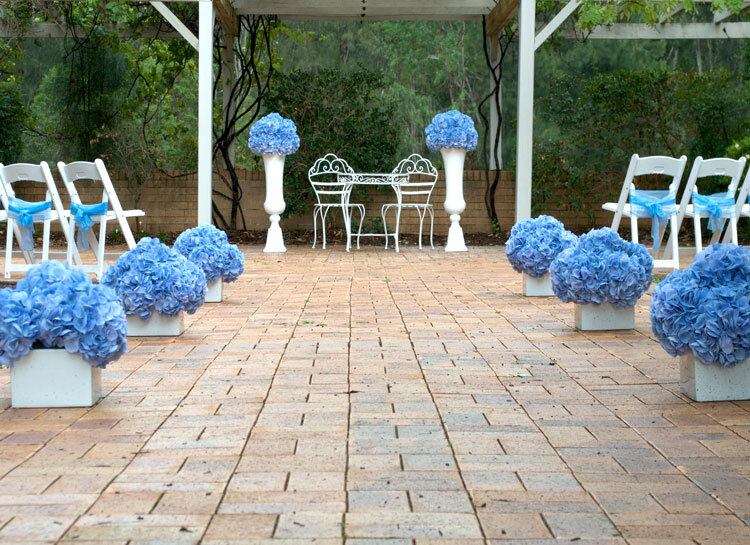 Below we have created a fantastic blue floral wedding ceremony decoration to highlight the contrast to the white. Get creative with your wedding setting and add colour to give your wedding ceremony a less traditional feel. Our single pot floral beds are perfect for creating a wedding ceremony aisle without the use of a runner. The floral arrangements perfectly line the way to the alter. Our white rose floral beds have a more traditional look and feel and when coupled with additional wedding aisle decorations, like our lantern decorations in the image below, create a wonderful effect. 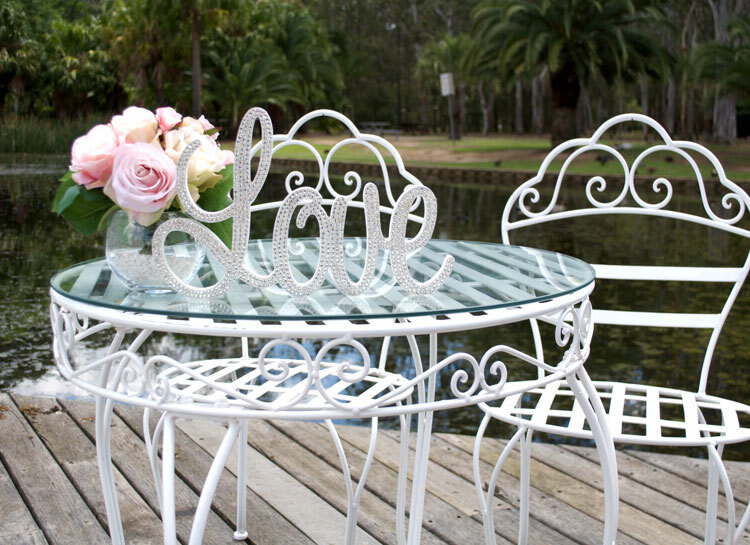 The iron signing table makes the perfect feature for signing your wedding certificate and needs only minimal decorations like our mini love sign and a small floral arrangement. Floral rose balls are a very popular wedding ceremony decoration. They add height to the aisle and are a great feature for wedding photos during the ceremony. The wedding arch provides the perfect backdrop to any garden wedding setting. As part of our wedding decoration hire service we love create unique and custom wedding ceremony setup’s. Our extensive range allows us to design and style all kinds of wedding arrangements and if we do not have a certain item available you can either source the item and have it included or we can source it for you. We have a huge range of wedding decoration hire items that can be added to a ceremony hire package or, if available, as individual hire items. For a complete list call today on 0418 624 225 or complete the enquire form.